FILE - A shiitake mushroom is seen inside a greenhouse at the Anzai family farm in northern Japan, April 5, 2011. An upstart U.S. food technology company has developed a unique fermentation process using mushrooms to reduce bitterness in cocoa beans that it believes will cut sugar content in chocolate candy. A year after first launching its fermentation method to reduce bitterness in coffee beans, one of the world's biggest commodity markets, MycoTechnology, Inc. is expanding into cocoa and will launch its process on Tuesday. The market is smaller, but the potential may be bigger with health-conscious consumers seeking lower-calorie foods amid mounting concerns about obesity and diabetes. “We use mushrooms that we train specifically to remove unwanted aspects of food and infuse it with the natural health benefits of the mushroom,” said Alan Hahn, chief executive of MycoTechnology, Inc, formed in 2013 in Denver, Colorado. A light almond cream chocolate candy carries the initials for Russell Stover Candies as shown in Kansas City, Kansas, July 14, 2014. ​About half of the average milk chocolate bar is made of sugar, according to industry experts. Hahn said his MycoSmooth technology, invented by the company's chief science officer Brooks J. Kelly, can cut the amount of sugar needed in the average chocolate bar by half, from 31 grams to about 15 grams. 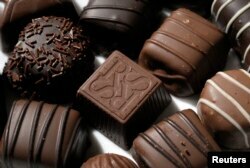 The company is in talks with “major chocolate players” in the United States, but Hahn declined to name them. From its Denver headquarters, the company will start processing its own beans as well as those on behalf of its customers and will license out the technology. The process will compete with other more widely used methods, including the “Dutching” process that was developed in the 1800s and modifies the bean's taste with an alkalizing agent. MycoTechnology's chemical-free process reduces the bitterness, rather than masking it, at minimal cost. It adds “pennies per lb” to the cost of cocoa, Hahn said. MycoTechnology's chocolate plans may, however, not be as simple as they first appear. Cutting the sugar content may pose new hurdles for confectionery makers if they cut sugar use and replace it with higher cocoa or milk content. Both are more expensive than sugar. “If you wind up taking sugar out and raising the [cocoa] liquor content, you will raise the fat content of the bar, which will be higher calories,” said Ed Seguine, president of Seguine Cacao Cocoa & Chocolate Advisors in Hanover, Pennsylvania, with over 30 years' experience in chocolate product research. “It doesn't make economic sense because you've got to put something in its place,” Seguine said. After coffee and cocoa, MycoTechnology is looking at widening the use of its procedure to bulk agricultural markets like rice and other grains. In the process, MycoTechnology takes fermented beans, sterilizes them and then inoculates them with their unique strains of mushroom root systems that have been trained specifically to remove bitterness. The beans are then placed in a sealed bag and for the following seven to 21 days, the roots do their work. Mushrooms naturally feed on moisture, oxygen and sugars.